Home News MEEK MILL JUDGE WAS A FAILED ACTRESS ... SO SHE'S JEALOUS AND BITTER!!! MEEK MILL JUDGE WAS A FAILED ACTRESS ... SO SHE'S JEALOUS AND BITTER!!! Meek Mill's been fighting an uphill battle with the judge who sent him back to prison since day one, because she's a failed actress taking her anger out on the famous rapper ... so claim sources close to the rapper. 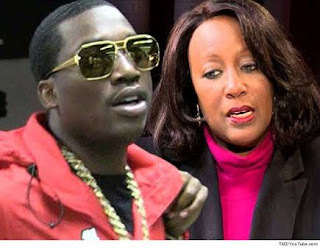 TMZ has learned Meek's lawyers plan to use Judge Genece Brinkley's career in entertainment -- or lack thereof -- as further evidence she has a longstanding vendetta against him because she's jealous of his success and celeb status. Judge Brinkley's only acting credit is for a 1993 TV movie called "Tell My Mom I Love Her," in which she played the mom. The movie starred Dustin Felder, who we're told is close with Charlie Mack. As we reported, Meek's team claims the judge was trying to pressure Meek into leaving Roc Nation for Mack. Meek's lawyers claim the judge is making the rapper pay out of bitterness for her own failure in show biz. As we've reported ... Meek's filed docs demanding his release from prison and to get Judge Brinkley booted from his case.